They might not have to contend with the elements, but interiors have to stand up to a variety of factors—kitchen smoke, dirty fingers, and furniture scrapes to name a few. Painters and their customers want an interior paint that covers past marks and offers scrubbability to make it easier to keep clean in the future—and look great too. For repaints in Santa Fe, NM, Mike Freeman is on the case. 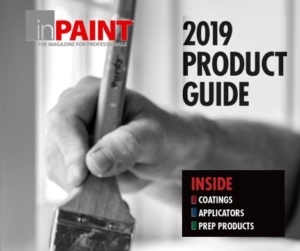 Managing both residential and commercial jobs, the owner of the Albuquerque-based Mike’s Quality Painting, Inc. turns to Sherwin-Williams as his primary interior paint supplier. Undertaking both residential and commercial work, this CertaPro Painters of the Main Line serves Philadelphia and its surrounding suburbs. James Williams, a senior residential sales associate with the company, focuses mostly on residential jobs and says he’s pretty loyal to Sherwin-Williams. The Cashmere Interior Acrylic Latex, he notes, gives a smooth, buttery finish, which customers appreciate, and his crews like that it’s easy to apply. And he often recommends the Harmony Interior Acrylic Latex for families with young kids and pets. In addition to the durable finish, he says, Harmony has properties that help promote better air quality and reduce odors. In wet areas, they might mix in additives for mold prevention, and they might go with a satin finish (vs. an eggshell for other areas). Paintworx, Inc. has done residential and commercial interior and exterior repaints throughout the Seattle area since 2012, when Joshua Voigt started the company. For residential repaints, he likes Sherwin-Williams Cashmere Interior Acrylic Latex, which he loves the look of, and Benjamin Moore Regal Select Interior Paint, which is a durable, highly washable acrylic resin product that is zero VOC. He also likes Ultra Spec SCUFF-X Interior Latex Paint from Benjamin Moore for high-traffic areas. “It’s noticeably mark-resistant,” he notes. And for wet areas like laundry rooms, bathrooms and kitchens, he appreciates mildew-resistant options like Benjamin Moore Aura Bath & Spa Interior Paint and Sherwin-Williams Harmony Interior Acrylic Latex. Fred Hamilton Contracting Inc., which serves the Albany, NY area, has different needs and expectations of interior coatings than other contractors for their apartment repaints and occasional commercial work. He says he gets a good deal on the PPG, even though he acknowledges that he might be spending a few more dollars per gallon than he would on another paint. “But that extra expense saves three to four hours’ worth of labor,” he explains. With more than 30 years in business, Carolina Painting & Pressure Cleaning, Inc. in Lexington, SC, tackles mostly residential repaints. As part of his services, he offers lifetime annual touch-ups. “So I want something that will touch up year after year, and the Harmony does,” he says. For kitchens and other wet areas, he leans toward the company’s Cashmere Interior Acrylic Latex because its super-smooth finish makes it easier to clean. When it’s time to paint ceilings, Kevin opts for the Sherwin-Williams ProMar 400 Zero VOC Interior Latex (flat). “I can touch up ceilings I did 15 years ago, and it still looks great.” He also appreciates that it’s a true flat paint with zero sheen. 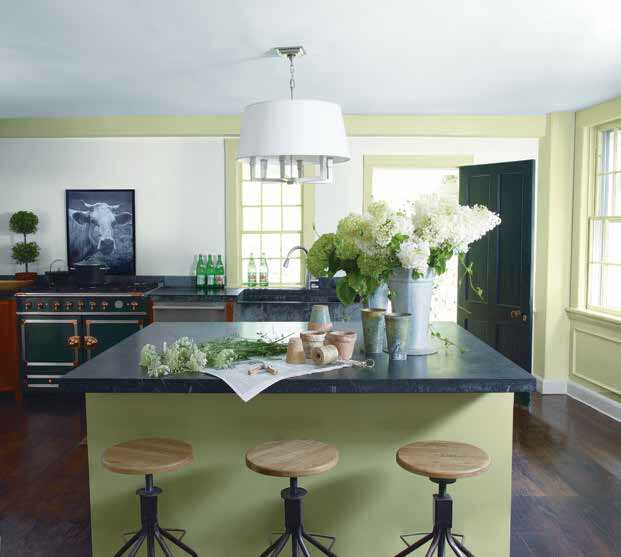 And for trim, he likes Benjamin Moore Aura Interior Paint (semi-gloss), which offers a rich, beautiful finish. “It’s one of the most expensive paints I buy, but it’s worth it,” he says.